Keep your horse clean and healthy. The most obvious reason to brush your horse is to remove dirt and debris from his coat. This is especially important before riding as dirt underneath your saddle or girth can cause painful sores. Daily brushing also helps to distribute the natural oils that protect the coat and create a healthy shine that you can’t get from only occasional grooming. Check for cuts, bumps and other abnormalities. Daily grooming sessions are a chance to give your horse a once over. 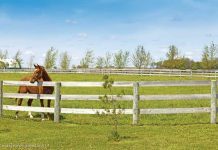 Becoming familiar with your horse’s normal condition is essential to help you recognize when a new scratch or bump appears. Bond with your horse. Horses are gregarious animals. You may have noticed your horse standing next to a herdmate while they scratch each other’s backs. This behavior is called mutual grooming and is one way that horses bond. When you brush your horse, you’re strengthening your bond with him. More than just part of the pre-ride routine, grooming gives you some stress-free, quality time with your horse. Your rubber curry comb is the most important tool for removing stubborn dirt and promoting healthy circulation. Using moderate to heavy pressure, move the curry in large, quick circles over your horse’s coat on his neck, back, barrel, and haunches. This will help bring dirt and loose hair to the surface of the coat to be brushed away. The curry is not meant to be used on the more delicate, bony areas such as the legs or face but you can use a soft, rubber grooming mitt to remove mud from those areas. Some horses really enjoy being curried and will lean into the curry comb while others are more sensitive and won’t tolerate too much pressure. Gauge your horse’s response to currying and use as much pressure as is comfortable for him. After the curry, take your stiff-bristled body brush and using long, sweeping motions, brush off the dirt and loose hair brought to the surface by the curry. Use a flicking motion at the end of each stroke to remove the dirt. Again, with the stiff-bristled brush, only go over the broad, muscled areas of the horse’s body and not on his face or legs. Your medium- and soft-bristled brushes can be used over your horse’s entire body. The medium brush is more effective for a dirty horse and can be used carefully to remove dried mud or other stubborn dirt on the horse’s legs. The soft-bristled brush is also called a finishing brush and while it is not necessary for daily use, it will help polish your horse to a show-ready shine. A soft-bristled face brush is a smaller version of the finishing brush and is meant to be used to detail the areas around the eyes and ears that are difficult to clean with full-sized brushes. For a final touch, use a towel, rag, or sheepskin mitt to remove fine dust from the surface of the coat. Picking out your horse’s hooves is extremely important whether he wears shoes or not. A rock stuck in a hoof can bruise the sole and leave your horse lame for days after it’s been removed. Additionally, mud or manure left for too long in the hoof can cause a bacterial infection known as thrush. It doesn’t matter where in the grooming process you decide to pick your horse’s hooves, but be sure to do it every time. Stand next to your horse’s shoulder or haunches facing toward his tail. Run your hand closest to him down his entire leg, feeling for unusual bumps, swelling or cuts along the way. Squeeze gently above the fetlock to tell your horse to pick up his hoof. If he doesn’t pick his hoof up right away, lean against him to encourage him to shift his weight off the leg. When he lifts his hoof, slide your hand under the front of the hoof to help support it. Start at the top corner of the hoof, in the groove next to the frog and pick downwards, making a diagonal line to the center of the toe. Do this on both sides of the frog, and once you’ve removed the large chunks of dirt, use the brush to remove whatever is left. It is not necessary to comb your horse’s mane and tail every day. In fact, in doing so you may rip out a great deal of hair. On the other hand, if you let it go too long, you’ll find that your horse is sporting a full set of dreadlocks. Check your horse’s mane and tail daily to make sure that there are no burrs or weeds stuck in his hair. Every few grooming sessions, take the time to carefully detangle your horse’s mane and tail. Work in small sections to pick out large knots and tangles by hand rather than using a comb. This will help prevent breakage. After you’ve detangled it, you can use a brush or comb by starting at the bottom of the hair and working your way up toward the roots. Use a detangling spray to help get rid of stubborn snarls. Enjoy the time spent grooming your horse. Regular grooming sessions will help keep him happy and healthy and looking his best.